You know a product is successful when your 2nd grader asks, on a Saturday evening, to play the “Multiplication Game”. This is the experience we had with our newest math review. I received the Times Alive download from City Creek Press. I was excited about the product because my daughter needed a little boost in remembering her multiplication facts. Frankly, I get bored doing flash cards and she gets bored writing the facts out. We were anxious to try a different approach. 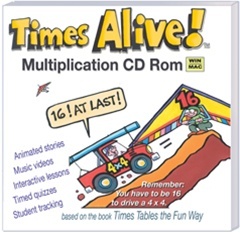 Times Alive uses stories, movies, songs, and animated pictures to teach children the 0 to 9 multiplication facts. It is silly, colorful, and fun! My daughter enjoyed it and asked several times to play it (instead of doing her math assignments). I always tell my children that their education is not about completing an assignment or staying on schedule. It is about learning. So, I let her. I can honestly say that it has helped. What I did not expect was my 2nd grader to enjoy it so much. I have only taught a few of the multiplication facts to him this year. But he picked right up on it and can remember as much (if not more) than his sister. Both of the children will continue to use this software throughout the rest of the year. If you have a child who needs a creative way to learn their multiplication facts, this is the program for you! You can purchase it as an instant download for $44.95 or on CD for $48.95. The program can be used with all your children which makes it an affordable solution! To see a YouTube Video Sample, click here. To find out what others are saying about Times Alive click here. Disclaimer: As a member of The Old Schoolhouse 2010-2011 Crew, I received the Times Alive Download in exchange for an honest product review. I do not receive any other form of compensation for the reviews posted on this blog. We loved this review! It has really help my kids. I am just stopping by on the Blog Walk. We loved Times Alive! Stopping by on the Blog Walk to say hi!